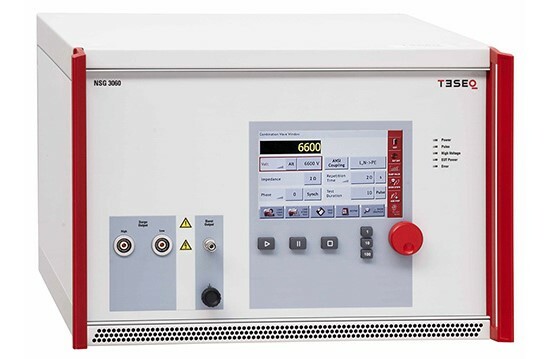 Teseq’s new NSG 3060 is an easy-to-use multifunction generator that simulates electromagnetic interference effects for immunity testing in conformity with international, national and manufacturers’ standards including the latest IEC/EN standards. The NSG 3060 system is designed to fulfil conducted EMC test requirements for CE mark testing and ANSI C62.41, including Combination Wave Surge (6.6 kV), Electrical Fast Transient (EFT) pulses (4.8 kV), Ring Wave (6.6 kV), and Power Quality Testing (PQT). Expansion capabilities enable the system to be configured for a much broader range of applications including Telecom Surge 10/700 and Magnetic Field tests. Depending on your exact testing needs, different models are available to ensure the NSG 3060 is configured to your exact testing requirements.